For a few weeks every year we have access to fresh garbanzo beans, something that I'd never really encountered until a few years ago. I've done a number of different things with these in the past but tonight I wanted to try something new. 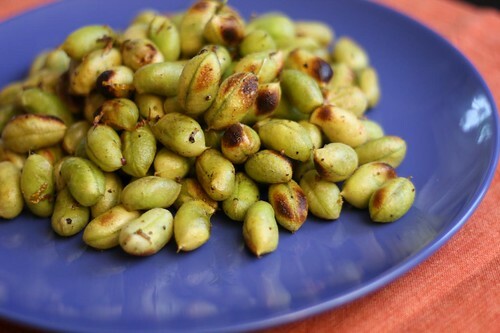 I was reading something about cooking garbanzo beans sort of like the way you would cook edamame beans in the pod. I decided to give it a try. I browned some lemon zest with some olive oil and tossed the garbanzo beans with this along with salt and pepper. They didn't get quite enough color so I threw them under the broiler where they crisped up nicely. While they were delicious they weren't quite as easy to eat as edamame pods. Each garbanzo bean requires a different method to open it. Each time I thought I'd figured out a clever new method to opening the bean pods I picked up the next pod only to find out that the previous method was unsuccessful on a different pod. Also they were quite slippery after being tossed in olive oil. All this complaining shouldn't overshadow the fact that the beans were quite tasty cooked this way. The toasted lemon zest was a great pairing with the beans. While I was delighted to not have to remove the beans from the pods prior to cooking them we had to pay for this by peeling them individually afterward. They're like pistachios: delicious but you have to work for it. Jen's sense of taste is not quite back yet but I was able to prepare a dinner that she could sort of taste. I roasted some broccoli with olive oil, crushed garlic, salt, and pepper. Then I threw it into a hot pan with roasted red peppers, white wine, lemon juice, and cooked fresh linguine. To finish the dish I tossed in some ricotta. 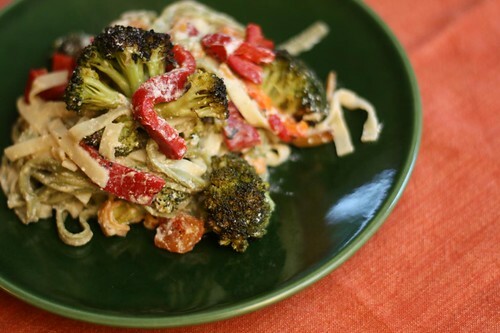 Jen was able to almost taste the broccoli from the large amount of garlic I roasted it in so I am confident that by tomorrow night she may regain her sense of taste completely! 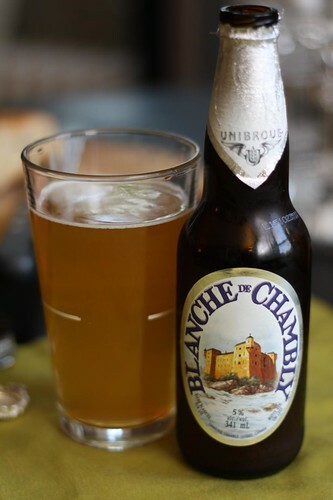 Since it's been so long since I've had a Belgian beer (about a week) I decided to make my beer tonight be the Blanche de Chambly by Unibroue. Unfortunately this beer did not feature guys in musketeer hats or beautiful French women but instead just a picture of some fort where some French guys fought. Happily this was a very tasty white ale. For more information check out their website where they feature a video of a fantastic Quebecois man in a beret telling the story of Captain De Salaberry. I enjoy a beer that comes enclosed with a history lesson.